Hi Friends: Here's a Brentwood Valentine's Day hug to all of you! 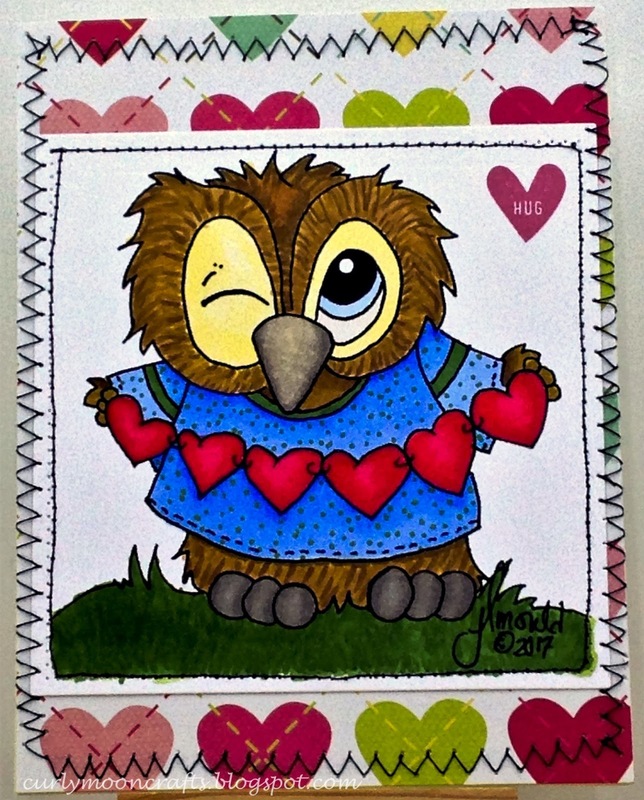 This card uses the Brentwood Owl Whole Lotta Love digital stamp from JessicaLynnOriginal.com. (Yes, the card is a bit plain and simple - it was donated to Cards from the Heart card drive for children and there were many restrictions on what could be used.) Have a Happy Valentine's Day! The image was printed onto plain white cardstock and colored with my Spectrum Noir Markers. The background paper is We R Memory Keepers Be My Valentine paper, layered onto an A2 card base. I used my sewing machine to stitch around the edges of the papers, to add a bit of dimension. Thanks so much, Donna, I appreciate your comments. I love using my sewing machine on my cards and layouts. It just makes me happy!